The ancient Egyptians could not have reached the cultural heights they achieved without the periodic flooding caused by the Nile. Without the yearly inundation, there would have been a barren wasteland instead of fertile fields. 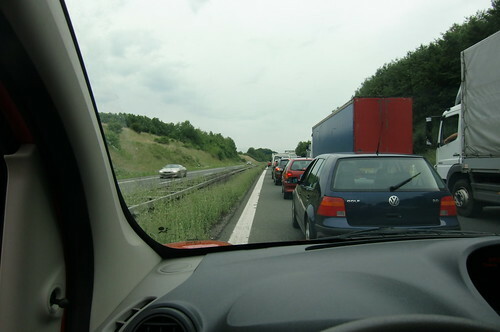 On July 20, 2011 I drove home from work without checking the traffic on the Internet and ended up in a 2-hour traffic jam due to a flooded autobahn. The whole county was heavily impacted, even railroad service came to a standstill. The next day, I bought a newspaper to see what had happened. Seems like many others had the same idea, since there was only one issue left. By chance, there was also an article concerning the planned 1st Workshop Day for Amateur Musicians by the Bamberg Symphony Orchestra. All you had to do was play an orchestra instrument, invest 40 EUR and write an application - which I did forthwith. Also, I informed some of my musical friends. The feedback was to be in September - and as you can see in my blog posted on September, 15, I made the cut. Later we were told that every application was accepted, since they did not want to turn away anybody the first time. Later, we received the agenda, a plan of the concert hall and the information that the day would be concluded by a public performance of the final movement of Dvorak's Symphony from the New World - a challenging work, also for the viola group. An intensive practicing period started, on top of that I bought a recording and the score. Finally, the long-awaited day had arrived and I set out quite early to be in time for the registration. There where so many participants that every room of the concert hall - even the lobby - was used for lessons, workshops and rehearsals. According to the Education Team, the only exeptions were the rest rooms. Usually, one would have to audition in order to even study with the musicians of the Bamberg Symphony Orchestra. If accepted, the hourly rates would be in the three digit USD range. Yours truly obtained one hour one-on-one coaching with one of the viola players. Since my chamber orchestra wanted me to perform the solo part of Telemann's Concerto in G Major for Viola and String Orchestra, TWV 51:G9 I could obtain some valuable advice for my playing. In the afternoon, we had one hour with all the viola players (one child had brought along her teacher, so there were 2 pros and five amateurs) to rehearse the Dvorak. Amazing how much you can achieve in just one hour if the instructor is as competent as ours was. Now it was time for last minute preparations and the rehearsal with all musicians onstage. Again, just an hour - but the director (one of the concertmasters of the Bamberg Symphony Orchestra) achieved just the right medium between disciplined work and relaxing, funny, supportive banter. In the early evening, the smaller ensembles (some of them just formed today) presented their music, then the great moment had arrived. It was very impressive to be on this stage, pros and amateurs interspaced and everybody giving it their best shot. The power of a big symphony orchestra is just unbelievable - usually I play in a 17 piece string orchestra - and carried everybody to new heights of capability (like they say, the tide lifts every boat). Though I dropped some notes, the pros filled in and it was a very exhilarating, spirited performance. Yesterday, I had another session with my ACMP quartet friends. We planned on tackling Mozart's KV 575. As a habit, I record the date and company whenever I play a piece for the first time, therefore I saw from my part that we had played this piece on our very first session (exactly eight years and two months ago). Back then, the 1st violinist said she wanted to play Mozart # 8 so I bought the corresponding music of Mozart's early string quartets. As I learned about the misunderstanding, I was shocked. Having restarted taking violin lessons just months ago after a decade-long hiatus, I was very challenged by playing a late Mozart quartet prima vista. Anyway, my then new found partners supported me with patience, understanding and their own sterling technique and rhythm, so I (and more or less the work, too) survived, even getting in some beautiful sounds in the easier parts. We were amazed that our musical partnership has already lasted for so long. After Elgar's "Salut d'amour" as a warm-up, we proceeded to KV 575. This time, I did not come unprepared. On top of some time in the practice room, I had immersed myself in the sound of the work by listening to a recording during my commute during the last few days. Plus, eight additional years of lessons, practicing and playing in various settings had not been in vain. While still far from perfect, I was a much better partner this time and enjoyed myself a lot more. Also, my friends assured me that my playing had "matured" considerably since the last time we played the piece, notably was I now able to play the accompanying 1/8s not only correctly, but also in the appropriate dynamics. 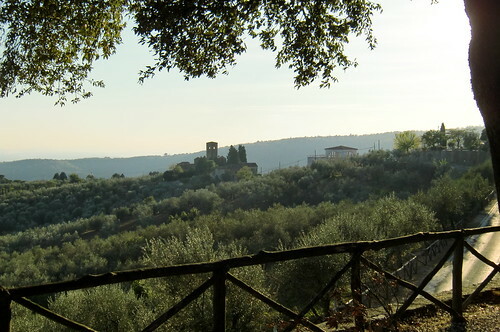 Afterwards, I told them about my recent vacation in Tuscany, especially about the dearth of music stores in the area. Next time, we plan on playing Elgar's string quartet, which our violist has already played with another group. This morning, I ordered the sheet music (score and parts) as well as a recording. No unpleasant surprises this time ;-) .